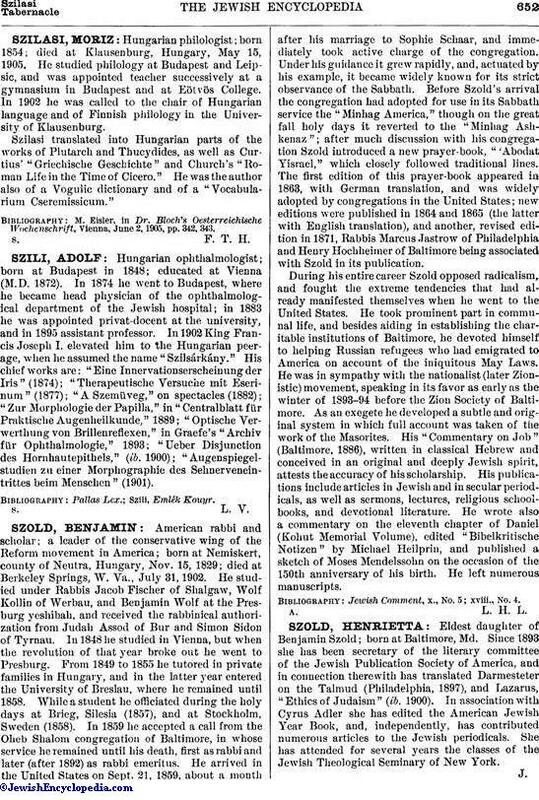 American rabbi and scholar; a leader of the conservative wing of the Reform movement in America; born at Nemiskert, county of Neutra, Hungary, Nov. 15, 1829; died at Berkeley Springs, W. Va., July 31, 1902. He studied under Rabbis Jacob Fischer of Shalgaw, Wolf Kollin of Werbau, and Benjamin Wolf at the Presburg yeshibah, and received the rabbinical authorization from Judah Assod of Bur and Simon Sidon of Tyrnau. In 1848 he studied in Vienna, but when the revolution of that year broke out he went to Presburg. From 1849 to 1855 he tutored in private families in Hungary, and in the latter year entered the University of Breslau, where he remained until 1858. While a student he officiated during the holy days at Brieg, Silesia (1857), and at Stockholm, Sweden (1858). In 1859 he accepted a call from the Oheb Shalom congregation of Baltimore, in whose service he remained until his death, first as rabbi and later (after 1892) as rabbi emeritus. He arrived in the United States on Sept. 21, 1859, about a month after his marriage to Sophie Schaar, and immediately took active charge of the congregation. Under his guidance it grew rapidly, and, actuated by his example, it became widely known for its strict observance of the Sabbath. Before Szold's arrival the congregation had adopted for use in its Sabbath service the "Minhag America," though on the great fall holy days it reverted to the "Minhag Ashkenaz"; after much discussion with his congregation Szold introduced a new prayer-book, "'Abodat Yisrael," which closely followed traditional lines. The first edition of this prayer-book appeared in 1863, with German translation, and was widely adopted by congregations in the United States; new editions were published in 1864 and 1865 (the latter with English translation), and another, revised edition in 1871, Rabbis Marcus Jastrow of Philadelphia and Henry Hochheimer of Baltimore being associated with Szold in its publication. During his entire career Szold opposed radicalism, and fought the extreme tendencies that had already manifested themselves when he went to the United States. He took prominent part in communal life, and besides aiding in establishing the charitable institutions of Baltimore, he devoted himself to helping Russian refugees who had emigrated to America on account of the iniquitous May Laws. He was in sympathy with the nationalist (later Zionistic) movement, speaking in its favor as early as the winter of 1893-94 before the Zion Society of Baltimore. As an exegete he developed a subtle and original system in which full account was taken of the work of the Masorites. His "Commentary on Job" (Baltimore, 1886), written in classical Hebrew and conceived in an original and deeply Jewish spirit, attests the accuracy of his scholarship. His publications include articles in Jewish and in secular periodicals, as well as sermons, lectures, religious school-books, and devotional literature. He wrote also a commentary on the eleventh chapter of Daniel (Kohut Memorial Volume), edited "Bibelkritische Notizen" by Michael Heilprin, and published a sketch of Moses Mendelssohn on the occasion of the 150th anniversary of his birth. He left numerous manuscripts. Jewish Comment, x., No. 5; xviii., No. 4.